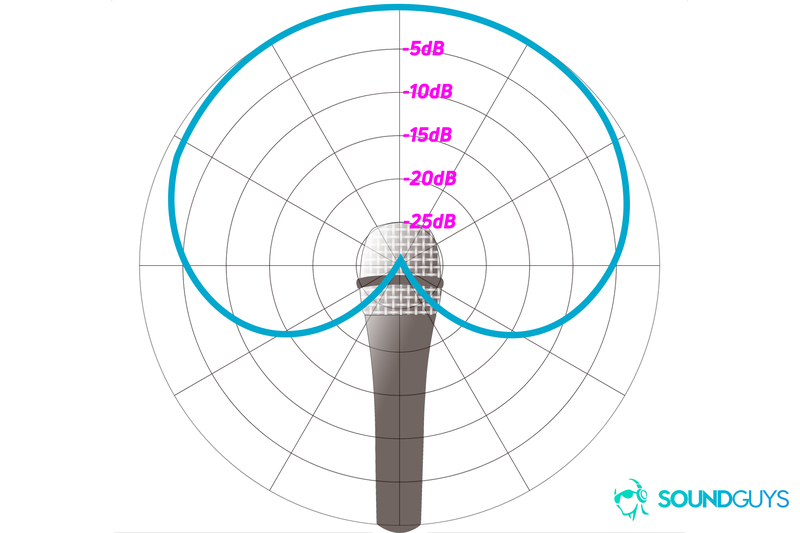 If you’ve been reading reviews on microphones, you’ve probably stumbled across a polar pattern before. Essentially, these charts are meant to show you how the microphone you’re looking at records sound around it. But it’s an imperfect chart because you can’t really tell exactly what it’s saying at first glance. We’ve compiled a cheat sheet for you to make sense of the information you’re looking at. Essentially, microphones are capable of detecting and recording sound in several different ways, but not every microphone functions the same way. Some microphones can capture sound from almost every direction, while others require your subject to be directly in front of the unit. When microphone manufacturers describe the directionality of their microphones, they’re talking about where your subject can be in relation to the microphone in order to be recorded. We’ve added a microphone to help explain the chart. To better explain this, manufacturers will include what’s called a polar pattern on the box (or in the documentation) to show users what the pickup pattern is like—but the axes and lines aren’t often explained. In all the charts below, imagine the microphone’s diaphragm element is right on that horizontal line, with the front facing the top of the circle, and the back facing the bottom of the circle. Each line extending from the microphone to the outer edge of the chart represents a 30 degree angle away from “on axis” (or 0-degree deviation) sounds. Each circle radiating away from the center indicates the microphone’s ability to pick up sounds. Essentially, the area inside the blue lines is where the microphone can record its subject in relation to the power of the sounds it can pick up. The closer your subject is to the microphone, the easier it is for it to record quieter sounds. So what do all those confusing terms about pickup pattern mean? Let’s take a look! This type of microphone captures sound from all directions at once. If you’re looking to buy a lapel microphone for an interview, or are going to be on camera, you’re probably going to run into this pickup pattern in most of the products you look at under $100. While these mics are great for capturing a room’s ambiance, it’s not so great if you’re recording in a noisy environment and need to isolate a person speaking, or a singular instrument. This pattern can pick up sounds from both the front and back of the microphone. This type of microphone is quite rare, and is fairly limited in its usefulness. Sounds coming from directly in front of and directly behind the microphone will be picked up easily by this type of unit. A bidirectional microphone picks up sound from in front and behind of the diaphragm. Typically, these microphones will look nothing like the microphone in the diagram, but more like the old standby the Blue Yeti. You will need to angle the microphone straight up, or upside-down so that the diaphragm is facing your subject, rather than merely pointing the protective grill at whatever you want to record. If you studied Latin in high school, you’d know that all “cardioid” means is “heart-shaped.” That’s it! A cardioid pickup pattern can record sound from the front and sides of the unit. This type of microphone is quite good at capturing sound that’s generally in front of the recording element, but it can be at an off-angle and still be fine. This is probably the most common type of pickup pattern for consumer microphones, as it is very forgiving on the user for its placement, while also preventing interference from sounds behind the mic showing up in your recordings. Found mostly on what’s called a shotgun mic, this pattern is exceptionally good at picking up sounds that are directly in front of the microphone… and very poor at recording sounds from the sides and back. This is exceptionally useful for recording certain instruments, calibrating systems, and recording on-camera audio. Unidirectional microphones are great at picking up sound in front of the mic, but not very good at recording sound from the side. While these mics are good at picking up sound from a single subject, the audio can sometimes sound a little strange because the world around them isn’t recorded. You may want to record from a backup cardioid or omnidirectional microphone if you decide the surrounding environment adds to your scene. This kind of pattern is very similar to that of a hypercardioid, but slightly different. If you’re having a tough time deciding between a hypercardioid and supercardioid microphone, you can’t really go wrong with either, as they are both great at isolating a subject at a distance. Of course, these are just general characteristics, and microphones will almost always vary a bit. But you can learn a lot about how you should use a microphone by reading its polar pattern! Sometimes polar patterns will diverge from what their branding says, but you now know enough to understand the polar pattern without getting thrown off by what the box says.